When it comes to choosing between a Mahindra and a Toyota, every Indian seems to be in a pickle. First of all, this is due to the fact that we all love Toyota Innova very much – it is easily the most favourite MUV of all times. Along with Innova, Indians have also accepted Innova Crysta, its chicer variant, quite well. So when pitted against the very hardy and stylish Mahindra XUV500, whether new or used, Indians face the dilemma of their lifetimes. With respect to design and style, the two cars are very much different. The Toyota car has the traditional MPV design that most Toyota cars are born with while the Mahindra progeny is a rugged looking crossover that speaks volumes with its sheer presence. Crysta has a wheelbase of 2750mm and a length of 4735mm while the height and width of the car are 1795mm and 1830mm respectively. The dimensions of XUV500 are not much different. It has a wheelbase of 2750mm as well, a length of 4585mm, a width of 1890mm and a height of 1785mm. This Innova car comes with smoked out projector headlamps, large hexagonal grille and the 17-inch wheels. The Mahindra XUV500, on the other hand, has a butch appearance with gloss-black grille with chrome whiskers, flared wheel arches and a bulky exterior. Innova Crysta comes as both a seven and an eight-seater variant. There are captain seats available in the car in its second row and they are extremely comfortable as well. As mentioned earlier, the XUV500 is evidently wider than the Crysta on the inside as well but with a smaller wheelbase. This accounts for smaller legroom. The headroom is also lesser in the XUV500 as compared with the Crysta. For Crysta, the better headroom and legroom applies with respect to the third-row seats as well. Now let us come to the most important aspect of the two cars – the engine. The XUV500 comes with a 2.2 litre and a 1.99-litre mHawk engine having a maximum power output of 140PS and a peak torque of 330Nm. There are two variants of the transmission – MT (Manual Transmission) and AT (Automatic Transmission). Both are 6-speed transmissions with an average mileage of 16kmpl for the MT and 13.85 kmpl for the AT variants. A 2.4 litre 2 GD FTV and a 2.8 litre 1 GD FTV. The maximum power outputs for the two engines are 147 PS and 171 PS respectively. The peak torque generated is 343 Nm and 360 Nm respectively. The 2.4-litre variant comes with 5 speed MT and average mileage of 15.10 kmpl while the 2.8 litre comes with a 6 speed AT with an average mileage of 14.29 kmpl. 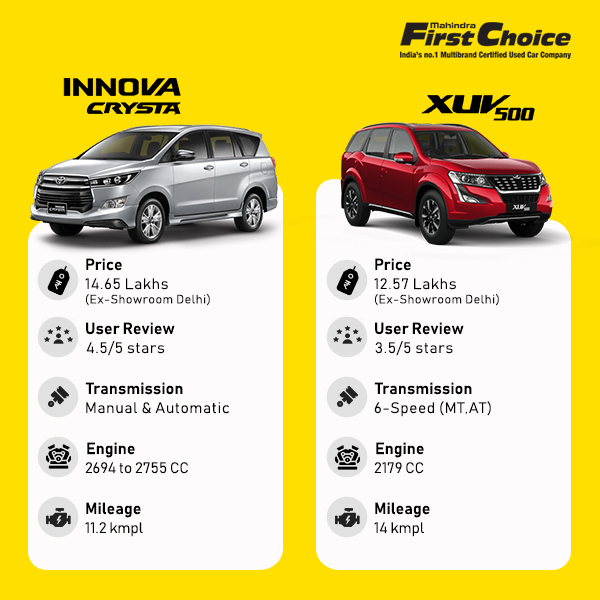 To compare the prices of the two used cars, the Mahindra car should win brownie points. Used car prices for the Mahindra XUV500 can go as low as 6.8 lacs (on an average) and go up to 13 lacs for newer models. For Crysta, this price is 7.4 lacs (on an average) and it goes up to 14 lacs. Buy Certified Used Cars from Mahindra First Choice Wheels. Previous Baleno or Hyundai i20- What Makes For A Better Choice? Next New Honda Civic- Will It Be Worth The Wait? Who Wins Baleno or Baleno rs?